Yesterday I posted a download for those of you who can’t directly celebrate Halloween in your schools or clinics. Today’s post if for those who are allowed to celebrate! In case you’re wondering, I’m planning to be a Flamingo for Halloween. Maybe you can bribe me into sharing the picture 🙂 The download has two sets of activities. 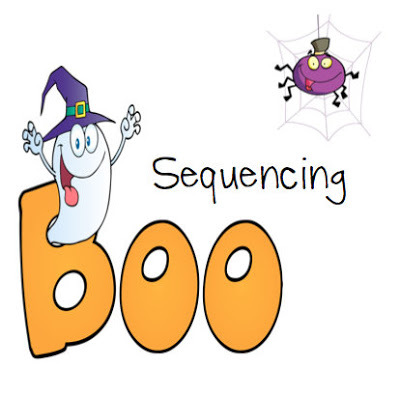 The sequencing activity features 3 part sequences. 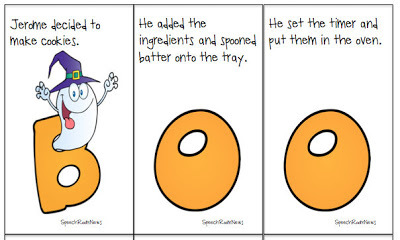 The students need to spell BOO with each sequence. To play I start with all the B’s spread out on the table and we add the appropriate O’s as we go. Make the activity easier or more difficult by limiting the number of sequences you are working on at one time. 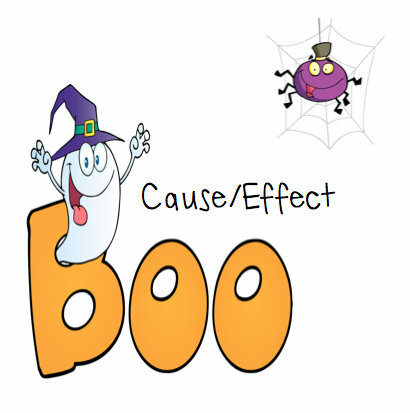 The second part of the download is a BOO Cause/Effect game. This game highlights that an effect can have multiple causes. Each letter B contains an Effect. 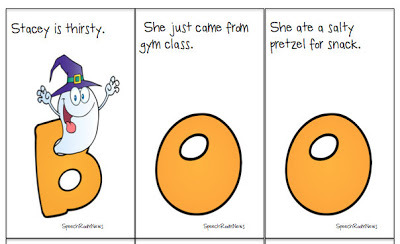 The O’s contain causes. Discuss multiple causes for effects with your students. Lay out all the B cards. 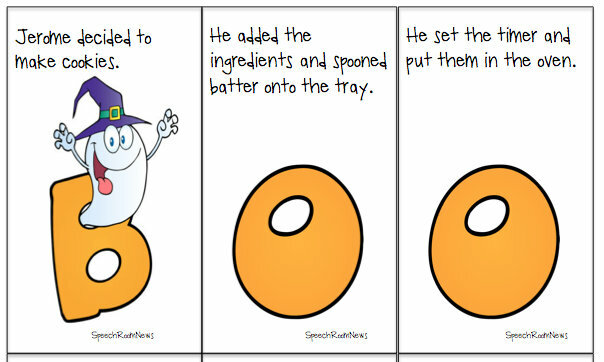 Have your students decide which O’s match to spell BOO. This packet is available on TPT. 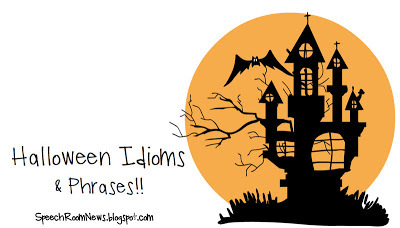 I put it on sale for today only 🙂 I also created a FREEBIE for you 🙂 This download features Halloween Idioms and phrases. The game features these cute Halloween friends. Each of the 30 cards, lists a phrase or idiom that relates to Halloween. Have your students verbalize a definition or use it appropriately in a sentence. The difficulty level varies within the cards, so you’ll be able to pick the appropriate phrases for each age group! Grab the FREEBIE in my TPT Store. 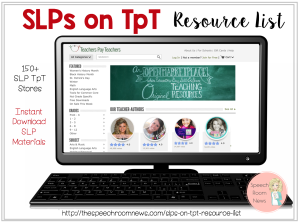 When you grab the freebie be sure to follow my TPT store and leave feedback! You can even say Thank You with a comment right here! Happy Halloween! Thank you!! I LOVE your materials!! It makes my lesson planning shorter. Ditto on the ink! Thanks!! I love your creative materials!! Your materials are awesome! 😀 Thanks so much for posting your great ideas! Can’t wait to use this. Thanks! Thank you, Jenna, for the spooktacular activity. My friends working on figurative language will surely think it’s “a scream”!! I greatly admire your creativity! You are so creative! Thank you for all the materials you provide! Thank you so much for sharing-it is much appreciated! Perfect timing for this! Thank you!! Thanks for being so generous! Your ideas are so creative and fun! Thank you for the idioms freebie!!! I don’t have any students working on them right now, but I cannot wait to use it in the future. 🙂 Wonderful ideas as always! Thanks for the freebie! I love to see what you come up with each day! Love it! Thanks for sharing the freebie! My fourth graders working on figurative language are going to enjoy this activity. Thanks for making my sessions more exciting for my awesome students! Hi Jenna! You know I love your ideas! Other than you hanging card file, how do you store all the activities you produce? Zip loc bags? Thanks for all you do! You have made my year! Right now I do ziplock bags, which are sort of sorted and grouped into little baskets in my cabinet. ie: grammar games, vocab games, artic games ,etc. It’s a struggle for me too! Thanks for the freebie! This will be a perfect seasonal activity for some of my students working on idioms! I have one group of 4th grade boys who will love these. Thanks! You help keep this grad student just a LITTLE more sane 🙂 Thanks for all you do! 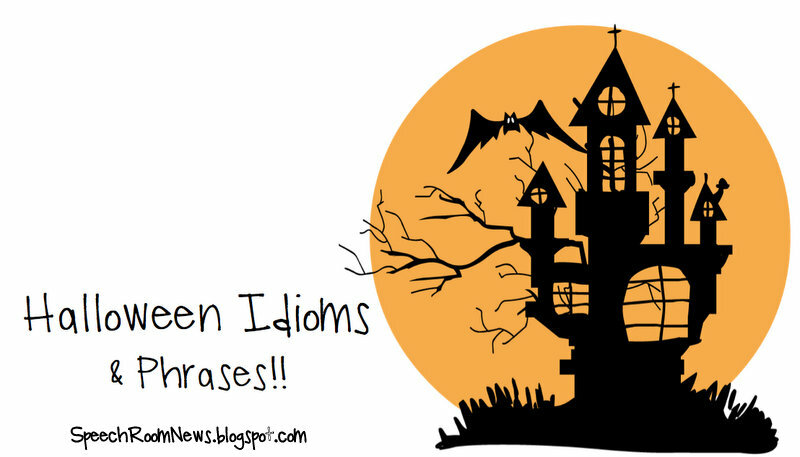 Thanks for the Halloween Idioms! I was just looking for some ideas a couple days ago. I love it! 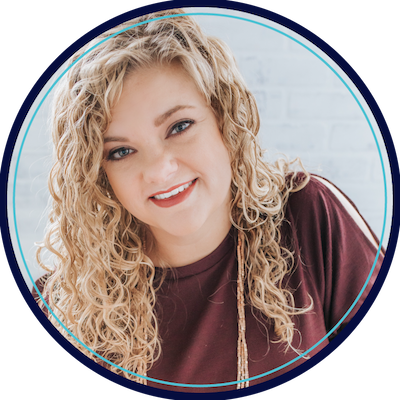 I have preschool, 5th-6th grades, special ed (moderate and severe) and jr. high/high school for speech-language therapy. I’ll be back! Thank you! Love your ideas! 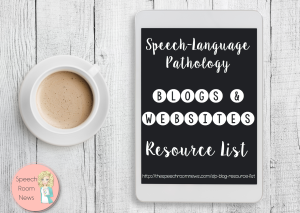 I am an online SLP and your activities work so well in that platform too!